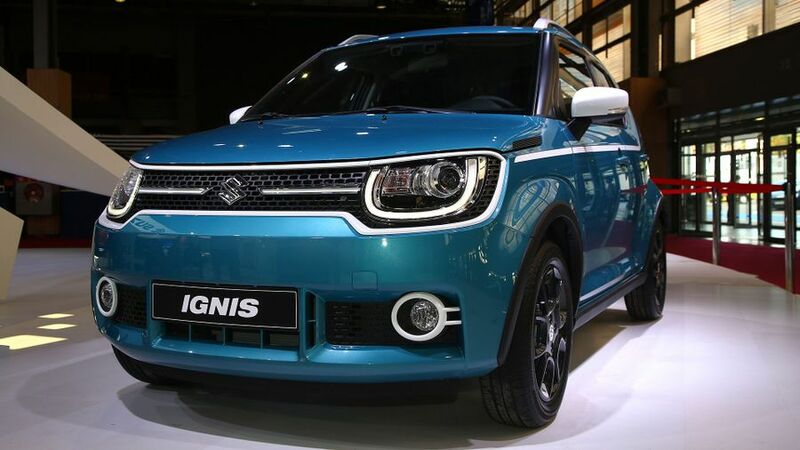 The New Suzuki Ignis crossover has been revealed at the Paris Motor Show. The Ignis is a familiar name in the UK, but the previous model went off sale here almost a decade ago. Think of the latest Ignis as a cross between a dinky city car and a small SUV, similar in feel, delivery and price to the Dacia Sandero Stepway, and a bit cheaper than the funky but brilliant Fiat Panda Trekking and Panda Cross 4x4 models. Unlike the Dacia though, the Ignis will offer two- or four-wheel drive, the latter dubbed ‘ALLGRIP’ so it should be able to match the Panda for off-roading ability. The European version of the Ignis is slightly larger than its Japanese relation, with different bumpers accounting for the increase in size. It should certainly turn heads here though, with bright colours, black alloys, roof rails and some interesting sticker decals – some of which are inspired by retro Suzukis from the 70s. Predictably the engines are on the small side, with a 1.2-litre Dualjet petrol engine that produces 89bhp and is familiar from the Swift and Baleno hatchbacks. However, Suzuki will soon introduce a hybrid model Ignis, with a lithium-ion battery pack and electric motor to compliment the petrol engine and help produce a CO2 figure ‘significantly below 100g/km’. Inside, the Ignis features a simple cabin layout, with sturdy plastics and a touch-screen for the infotainment system, that links directly to your smartphone, and incorporates Android Auto and Apple CarPlay. Modern safety features like autonomous emergency braking also make their debut. The boot is a respectable (by city car standards) 267 litres, although this drops to 227 litres on four-wheel drive versions, and the rear seats slide forward and back to make the load bay as flexible as possible. Due to go on sale in the UK early next year, expect prices for the most basic Ignis models to start around £10,000, rising to around £13,500 for the top-spec four-wheel drive petrol. Interested in buying a Suzuki Ignis?